The Change School WHAT’S the story? Tell a story that weaves in the experiences, values and talents that define you. Continuing from our Bold Career Primer Bootcamp this blog is all about our mini training from Week 2 where we discuss STORY. Welcome Back to those who joined us last week we when we covered the first foundational pillar PURPOSE. Today’s mini-training is all about Your STORY. Crafting a good story is essential for a successful career change because it tells the listener who you are, how your experiences have shaped you, how you make decisions, and the trials and turning points that have tested you. Everyone has a story to tell, and we all tell stories about ourselves. Stories define us - who we are, how we think, and what we believe. We get to know one another by exchanging stories. That’s why we often share stories of our childhood, school years, development of ideas/ideals etc when we want people to know us. A compelling story isn’t just “nice to have”; in today’s competitive career landscape, a compelling narrative is the most important factor for a successful career transition and getting business results - especially if you’re considering a major change in professional direction. Your narrative will help to transform the dry career facts into vivid accounts of your challenges and triumphs to make a strong, emotional connection to your listener. A good story inspires belief in our motives, character, and ability to achieve the goals we set. The aim is to tell a story that wins others support for your professional goals and vision for the future. It should be so deeply true and engaging that your listener feels they have a stake in your success. A coherent story makes the connection between your past and present obvious. Your narrative should provide context for your career journey, with coherent proof points to support your claims (to key skill sets or achievements), and most important , it should demonstrate your capacity to achieve the goals you set. The aim is to demonstrate your character - the skills, traits and experiences you have that convince your listener of your capability to make your bold career move a success. We need a good story to reassure us that our plans make sense - that moving on does not mean discarding everything you’ve worked so hard to accomplish. It will give you the clarity, conviction and courage you need to keep moving forward and pushing on. Your Story is your career to date. There is no ‘one way’ to craft your career story, but it should present your career history as a series of successes, skills and experiences that connect your past, present and future. Who You Are - Your personal/professional identity and brand in terms of skills, interests, experiences, traits and values. Your Personal/Professional Brand - Your unique value proposition, for example: Creative-thinker, Cost-saver, Ecosystem-builder, or Market-strategizer. Your Journey - Key milestones, promotions and achievements throughout your career history that reinforce your brand and establish the common thread. Your Vision - What is the purpose or intention behind your career transition. What inspires and drives you to achieve your goals? Identify underlying themes that connect your professional experiences. Maybe you’ve always followed an unconventional path; maybe it’s the prospect of the ‘next big challenge’ that excites and compels you to seek out new opportunities. Looking back on your career journey and examining key turning points will help to bring continuity to your narrative. This makes for a ‘better’ story by demonstrating a logical / intentional extension of your past, rather than coming across as someone who makes rash decisions. Explain your trajectory in terms of the value you bring to others. Career transition can sometimes be seen as a ‘red flag’ by prospective employers. Avoid this perception by emphasising your commitment to creating value. Avoid framing your story as “all about you” because while “seeking fulfilment” is nice, that’s not enough reason for someone to give you a job or their business. Explaining the unique value you bring will avoid any doubts or misperceptions about your commitment. It will also convince your listener that you are stable and trustworthy. Research confirms the importance of a narrative in job applications and interviews. Use them in your CV, Cover Letter, and Networking conversations to make a connection, enlist supporters, and carve out new pathways. Ground your reasons for change in your character - who you are. This allows you to incorporate learning and self-discovery into your story, rather than citing external factors that gives the impression you wait for things to happen instead of being proactive in pursuing your goals. Example of how to phrase this include: “I discovered I’m good at X” or “I enjoy X because it allows me to bring value to Y”. Frame your story around your personal/professional goals. Address any gaps in your career history with good reason - external or otherwise. Whether you’re citing personal/professional reasons (or both), the richer and more varied your reasons, the more acceptable and understandable your desired change will seem to your listener. If you took a break / left a job / job-hopped - explain WHY and position it around your goals. For Example: Self-Actualisation (discovering your talents and deciding to apply them more effectively) or Growth (a desire to furthering / stretching yourself to achieve your full potential). Reframe your past in light of the change you’re looking to make. They key is to make an easy-to-follow connection between your past experiences and your current goals. You’ll need to be strategic about what fits well and what can be played down. Your narrative should lend itself to the tale of your career reinvention or new direction. You may be exploring multiple options / alternatives for your next career direction. This means you must craft different stories for different opportunities and audiences. Be smart and selective here. Having four or five mini-stories in your back pocket will ensure you’re fully equipped for multiple conversations during your career transition. Follow a narrative structure with a clearly defined Beginning (the problem), a middle (the solution) and end (the outcome). For CV-writing, every company/role should briefly detail your remit or scope of work. Then, in no more than two to three lines, highlight your achievements and quantify your results (where possible). Try to start with an action word / verb and frame each mini-story in a challenge-action-result format. For example: Reversed a sales decline of 15% by streamlining operations and implementing new sales strategy for upselling related products. Practice telling your story so you feel confident in your delivery and that will shine through. Remember the goal is to earn the listener’s trust. Your career stakeholders are listening for clues that reveal: How you’ve pushed boundaries in your Life/Work; How you’ve faced and overcome challenges; How you make strategic decisions, and; The tenacity with which you’re willing to achieve your bold career goals. 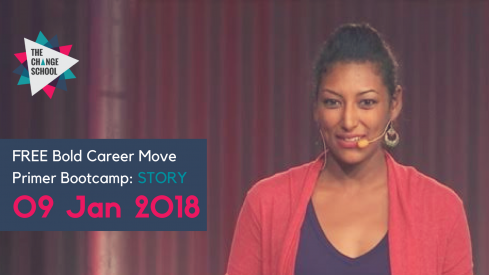 WRAP UP - We know today’s lesson has given you a lot of to think about; hopefully you’ve taken away some practical tips and strategies for crafting a narrative that supports your bold career move. Remember your story is your foundation. When done right, it can propel you into your bold career move by demonstrating what you already have, characterising your strengths as your career assets, and positioning yourself for the career opportunities you really want. Getting your story right will help you avoid having to invest more time and money into going back to school and getting those added credentials you think you need because the truth is, you’re already exactly where you need to be. See you on the other side in just a moment!